You’re big on colour, you like your bags small yet functional, and you’re definitely looking for something new that you can use throughout the festive season from Christmas all the way to the Chinese Lunar New Year. Well, look no further till you check out Mulberry’s new Small Darley Satchel that measures just 17 cm across by 12.5 cm in height. Made up of grained leather (my favourite kind too) that’s also leather-lined on the inside, what you see above are but 4 of the 6 different colours available in all, from Fiery Red and Grass Green to Macaroon Pink and Porcelain Blue. Made available with a long sling, here’s something else I like about it. Unlike most bags where you can’t remove the sling if you don’t need it, the Small Darley Satchel allows you to remove it completely and use the bag like a clutch. Or go one up and swap it for another strap that you might have, since that’s a big thing now to do as well. Priced at GBP635 (or around SGD1118 after conversion), the price also includes duties and taxes, and if you were to shop online at Mulberry from now till 28 November 2016, international shipping is free too. In other words, cute bag, great colours, no additional taxes to pay and with shipping thrown in, what else can you ask for, right? Until Johhny Coca joined Mulberry as their new Creative Director in July 2015. The Seville born designer who studied Art, Architecture and Design in Paris, hereafter he worked for world’s most renown fashion houses – Louise Vuitton with Marc Jacobs, and Celine with both Michael Kors and Phoebe Philo. With fresh eyes he took upon him a job that has resulted in already two incredible Mulberry collections. Two collections honoring the brand’s DNA, and reinforcing its British character with his 15 years of experience in the French houses. It has made me excited for what’s coming, especially after yesterday’s show during London Fashion Week. But let’s go back to the fact I was – actually still am – in London, for the first time at London Fashion Week after we moved across the big pond. Excited, because at this point in time, I was finally able to see all the shows I’ve always wanted to see with my own eyes, but especially moved by the fact I was here because Mulberry invited me to be part of this new chapter in the books of the brand. The brand that caused my first bag-crush, and now makes me crush on almost every single bag they have produced since Johnny Coca came onboard. New icons, a shoe-collection I’m dying over, and a Fall/Winter collection I can’t resist – of which I was wearing my favorite look to the SS17 show. And there is so much more to come. With yesterday’s presentation of the Spring/Summer 2017 collection – where we saw oversized Bayswater’s, statement jewelry pieces, and an amazing play of fabrics and proportions – Johnny Coca made pretty clear the brand’s new direction is here to stay. And he made us all love the brand even more. One of London Fashion Week’s best shows, and definitely the highlight of mine. The English designer brand Mulberry is determined to make a comeback with the Mulberry Cheyne Bag. A lot of thoughts have been put on details and the goal? The goal is to put a new iconic mark in the fashion world. Follow your heart, how does this bag feel? Minimal, extremely soft, easy-to-match, it feels like you can wear it in all seasons and carry it in almost every event. This bag can be your everyday bag. The beautiful clasp is the centerpiece of the Cheyne Bag and featuring a complementary dual chain strap to wear cross body or on your shoulder. Depending on the style, this bag is available in different leather. The basic version is crafted in calfskin, but Mulberry has made them in exotic leathers like Python or Embossed Croc as well. You can also pick bi-colors. Inside you can find one main compartment for all your daily essentials, there is also one internal zip pocket for your important stuff. While I wouldn’t say I’m personally obsessed with all bags related to the Mulberry, I have been keeping a close eye on their latest releases. Part of me wants them to do well commercially again, while another part of me is keen to see what else new Creative Director Johnny Coca will come up with next. And I must say, it has been interesting so far, from a reworked Bayswater for starters, to new styles like theMaple and the Winsley, both of which aren’t bad at all. Even something he did for the boys, the Mens Small Buckle Satchel, is pretty cool and something I can even see myself using. 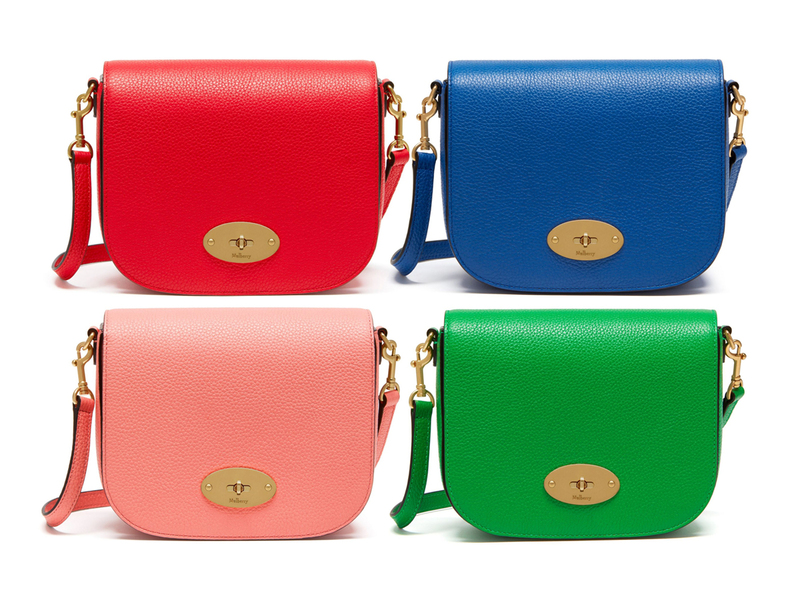 Which brings us back full circle to one of the first bags he created when he landed the job at Mulberry. Called the Camden, I wasn’t exactly a fan of the first one he did that came with a zipper running down the side. This newer one, from the Winter 2016 collection, does away with that and instead replaces it with studs, for a look that’s a tad military, a tad rock and something the more outgoing of girls amongst you can appreciate. Measuring some 26 cm across by 34 cm in height, the full leather bag (which comes with a suede lining), can be worn one of 3 ways, via its top handle where it looks like a bucket (shown above), over the shoulder (just readjust the lobster clasps on the sling to change its configuration) and on the crook of your arm, which would be the official tai-taiway. Priced at GBP945 (or around SGD1710 after conversion), you can buy it online viawww.mulberry.com where they offer international shipping (with free returns). Or head to Mulberry boutiques at Hilton Shopping Gallery and Paragon to try it out for yourself first before you decide. Looking for a versatile work bag? This could be it, and without breaking the bank too.